October/November 2017 - After meeting with your Advisees (the advising period begins Monday, Oct. 30) and approving their course selections for Spring Semester 2018, you will click on "Grant Permission to Register." January 2018 - Sometime during the first two weeks of Spring Semester 2018, you will meet again with your Advisees, review their FINAL schedules and if you approve, you will click "Review Complete." So now, let's review the process for "Grant Permission to Register" as you prepare for advising your students for Spring Semester 2018. More information can be found at "Instruction Manual for Advising & Registration." A date and a checked box will appear next to the name you’ve approved as you see in the screenshot below. Please remember, permission to register cannot be reversed once you’ve submitted. Your Advisees will know if they have received permission to register by looking at their schedules in Student Planning. The next screenshot is what the students will see if you have NOT yet given permission. Student Planning opens for students to begin planning their spring class schedules. The updated version of Student Planning goes live this weekend for both students and advisers. There will be a period of time that the system will not be available to students or advisers. Students will be notified in advance that the system will be unavailable during this time. 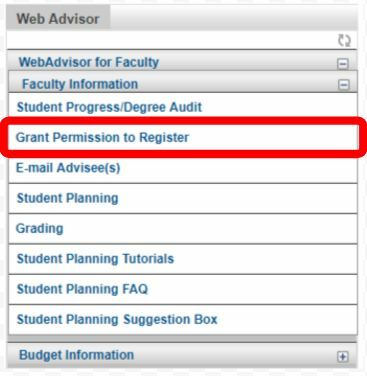 Meet with your Advisees and grant them “Permission to Register” in WebAdvisor. Remember, you lose Monday and Tuesday, Nov. 6-7 because of the Academic and Election holidays. Online registration for students. Remember that students are assigned registration appointments that are based, in part, on seniority, so if possible, meet with juniors and seniors first, then begin advising sophomores and first-years.